The few words of the Gettysburg Address changed the course of our nation. The few notes of Taps express a Nations thanks and gratitude for service as no symphony could ever do. The bugle call Taps has, for almost 150 years, held a special place in our American heritage. Originally conceived as a replacement signal to order lights out at the end of the day in the military, the call transformed into the funeral honors accorded all uniformed persons who have faithfully served our country. While still sounded every evening at military bases to signal Day is Done, the notes of Taps have become part of our national conscience. In times of peace and war the 24 notes of this familiar melody have been performed each day in virtually every part of our nation. As we approach the 150th anniversary of this famous call, TAPS 150 has been organized to mark this date. TAPS 150 is an organization incorporated to commemorate the 150th anniversary of the origin of Taps, our national bugle call. TAPS 150 is planning commemorative events, special concerts and events that will culminate with ceremonies at National Cemeteries in May 2012 and a re-enactment event in June 2012 at Berkeley Plantation where Taps was born. Taps beckons us to remember patriots who served our country with honor and valor. It is the most familiar of calls and one that reaches our deepest emotions. For 23 years I served as a military bugler at Arlington National Cemetery and felt firsthand the deep feelings it evokes. 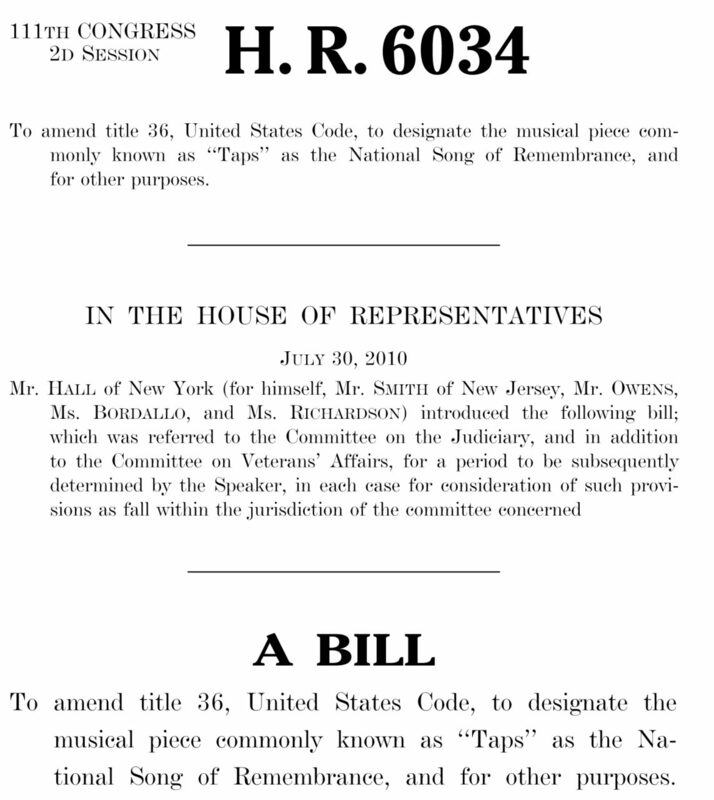 The time has come to recognize this simple melody as a national treasure; to make Taps our National Song of Remembrance; to grant it a status recognized throughout our nation. With each special event and project planned by TAPS 150, we strive to emphasize the importance of this national treasure. We need your help!! Contact your House Representative (Congressperson) and have them be a co-sponsor of HR 595 introduced by Mr. Reed of NY. Please don’t let this die in committee! 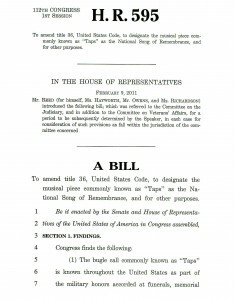 This entry was posted on Sunday, October 3rd, 2010 at 11:12 am	and is filed under Bugle Stories, Buglers Through History, Bugles for Performing and Collecting, Getting Started on the Bugle, History of Taps, History of the Bugle, News, Taps in Recent History, Taps Performance Guidelines, TAPS150. You can follow any responses to this entry through the RSS 2.0 feed. You can leave a response, or trackback from your own site.